Zanzibar is. 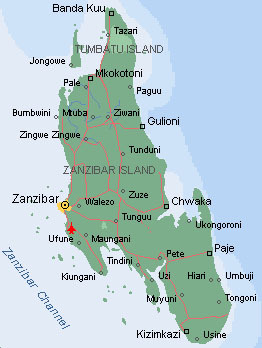 is located at 6°10 South and 37° East, only 40 Km from the Tanzanian Coast in the Indian Ocean. The island is very easy to approach, in the last two years is becamed a very actrative holiday site. The 5H1FS activity was planned into the month of February, looking for enjoyable place and a good reasonable "rare" place around the world, I and my wife had found in the north east coast of Zanzibar, near GULIONI, a fantastic Hotel called Kiwengwa Village , with bungalows facilities near the sea. Obviously founded the place, I needed to check out if the were any chance to obtain the license. Got in touch with Michael 5H3MS, one of the Tanzanian Amateur Club, he helped me to overcome some problem, buying the form request, checking out the license availability with the officer and sending me trough DHL the original paper. All this take about 3 month, the license was arrived only 5 days before leaving Italy. Ham Radio from Zanzibar is. The last operations from Zanzibar is. are dated 1995, but a significant request was showed up into the last 7 year due the sporadic activity after the late '80 activity of 5H1HK. Planning a dxpedition, that must be also a vacation, at least for my wife, seems easy but you need a background of hamradio experience. My full time activity in the Contesting World, as member of the Italian Contest Team IR4T, and cofounder of the MCC Marconi Contest Club, in the last 15 years has teached me that you need to plan everything if you want to be a success. So I have started to plan this "vacation" as a Contest, everything must be ready before the departure, all must be twice tested before the packaging and all must be ready for an heavy duty trip. So started to collect and test radio, computer, antenna, power ampl, power supply, carrying case, cables and all need accessories since the middle of April without any guarantee about the license, but a lot of hopes !! This Page was created with Microsoft FrontPage 2.0 by Fabio Schettino I4UFH. report, hints and suggestions are welcome .